A birthday present for my friend and fellow Staples slave, Tom. He likes penguins. He also likes Star Wars. You do the math! :B I thought this turned out like crap, but he loved it, so it's all good. Having people you know in real life actually like your artwork is such a treat! 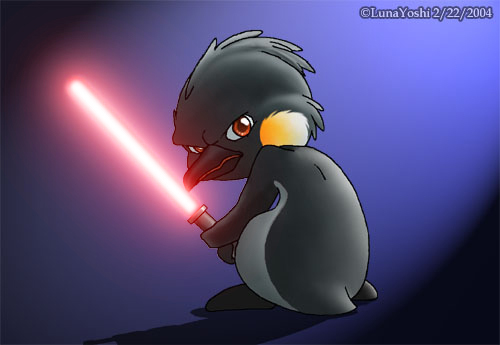 Penguin's ©God, or something. I lovelovelove Care Bears! I also lovelovelove my chatcrew buddies. So... here are all our yoshi characters as Care Bears. From left to right: VappyBear's ©Vaporshi, LunaBear's ©me, CoralBear's ©Coral, JadeBear's ©Laina-chan, PinkBear's ©Pink, and Touketsu Bear's ©Joey. Ray, Mighty, and Sonic from the Japanese (imported?) SegaSonic Arcade. Cool beans. Ray hasn't been seen in any games since, thus making him THE only Sonic character to never appear in a second game. Nobody knows who he is, either. He deserves much love. ...I know too much Sonic trivia. Ray the Flying Squirrel, Mighty the Armadillo, and Sonic the Hedgehog are all copyright ©SEGA. Julie-Su catches Knux off guard and gives him a big, mushy, lovey hug. I'd do the same thing if mon coeur died, stayed dead for awhile, and came back to life at the last minute to save the world from annihilation. *thumbs up to Archie for the OMFG SO BELIEVABLE AND NOT AT ALL CLICHE STORY LINE* :) Those lyrics are from David Gray's "Babylon." Good song. Julie-Su Echidna is ©Archie Comics, and Knux the Echidna is ©SEGA. So... I was involved in a really big, really dedicated Harry Potter online RP for awhile. Six months, I believe. It was loads of fun and I made a lot of new friends. Well, at the time, I liked it so much that I was determined to draw out each and every character as echidnas. I didn't get too far, but here are some familiar characters slapped on a Dark Age of Camelot screencap. I color coordinated the characters to match their house (that's why Luna Lovegood is blue, etc.) Anyway... from left to right... Luna Lovegood, Ron Weasley, Harry Potter, Hermione Granger, Draco Malfoy, and Pansy Parkinson are all ©J.K. Rowling. HARK... 'tis desktop wallpaper-size! I got a job as a front desk clerk at a gym, and sometimes it can get really, I mean REALLY, slow. So I pulled out my sketchbook, prismas and markers and went to work. Finally I've come up with a color scheme for Luna's hedgehog porcupine form, which I've waivered about for almost ten years. No joke, ten. 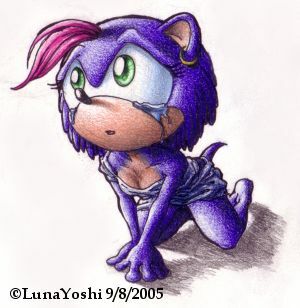 This is what sudden onslaughts of Sonic obsessiveness causes. Anyway, ignore the errors, and bear with me until I come up with a decent outfit for her. Luna Hedgie (even though she's a porcupine, I just call her that) is ©Stephanie Soderberg. 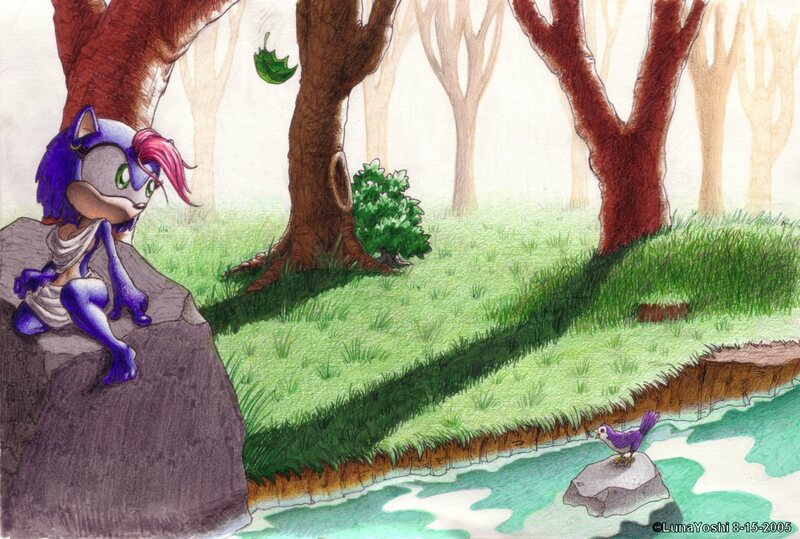 This concept was not originally mine. Pat 'Spaz' drew three characters at similar angles and with similar shading in the Lost Tribe arc in the Archie Sonic comics (Knux #10-12). I just tried my hand at it with my character. No inks = a bit harder, but way more fun. Experimentation galore. Luna Hedgie is still ©Stephanie Soderberg. Still bored at the gym and scannerless, I drew. My human anatomy's getting better, but I still think I just get lucky. Luna is sad because people steal her art. Or maybe not, I dunno. Maybe she's sad about something worthwhile and it's just me being unimpressed when I see someone's traced my artwork and called it their own original drawing. *growl* ANYWAY. Luna ©S. Soderberg. Yes. I don't normally follow baseball, but the Padres have this young player named Khalil Greene that I've just fallen head-over-heals in love with. He would have gotten Rookie of the Year the '04 season if he hadn't injured his finger a few months before the end of the season. ...Oh yeah, and he's hella cute. c_c So, uh... A TRIBUTE! Khalil*Skunk is ©his parents, and Luna Hedgie's still ©Stephanie Soderberg. God it sounds weird saying my name all the time. Drawing two echidnas snogging is hard. Their snouts are awkward and their heads are big. Um... I tried? 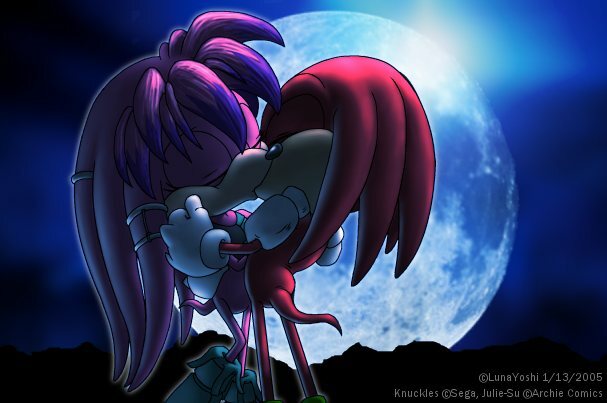 *sweatdrop* Knux/Julie-Su 4eva, beyotch. 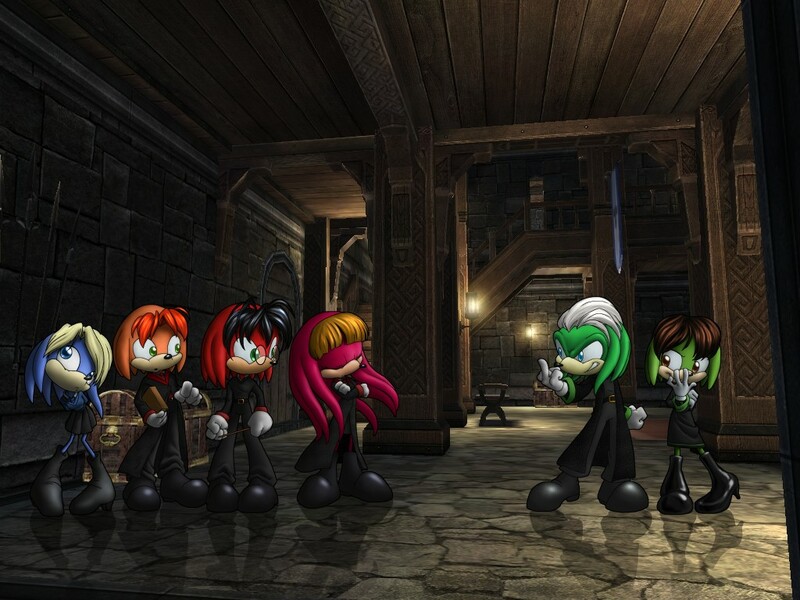 I still think Knux + Rouge = mutant children. 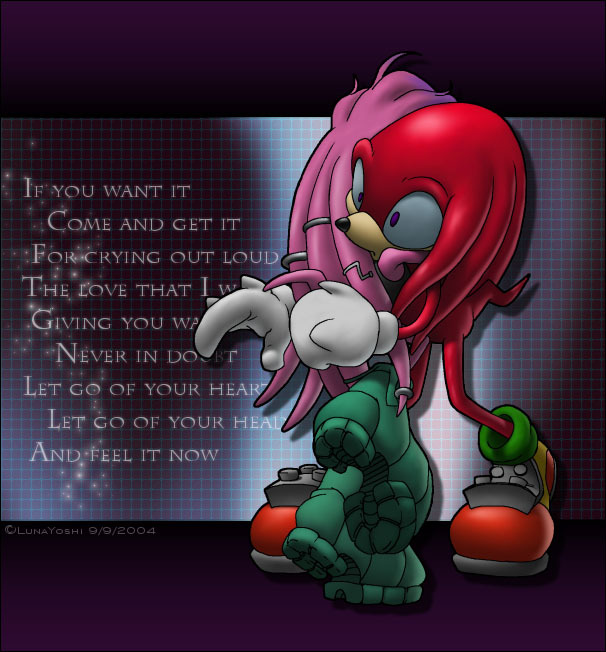 ..... By the way, don't e-mail me about that last comment if you support Knux/Rouge. You won't change my mind. Really. I don't care how much you want to yell at me. I'll ignore you. 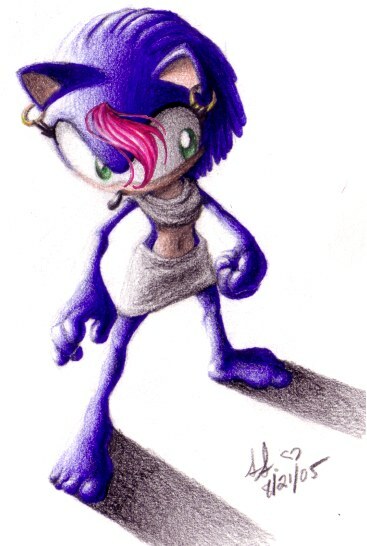 *steps off podium* Knuckles is ©SEGA, Julie-Su is Ken Penders' brainchild and he works for ©Archie Comics.